Hugo is Scorsese’s first family film, it is truly a heart warming movie of a young homeless boy named Hugo. Throughout this amazing movie we are exposed to spectacular sets and mystery seems to await at every turn. This movie produced by a talented director is based on a children’s book called “The Invention of Hugo Cabret” by Brian Selznick. This movie not only explores the many fantasies in our world today it also incorporates history in which many are unaware of. We not only enjoy the film we also learn about something too, this film teaches us the beginning of film itself and who was the founder of something so incredible. Set in 1931, a young boy named Hugo Cabret (Asa Butterfield) starts his journey to fulfill his father’s (Jude Law) last wish: to repair the automaton his father found in the basement of a museum. His father dies one night while working at the museum due to a fire and Hugo later on finds himself stuck with his uncle (Ray Winstone) who taught him to wind the clocks. Even with these obstacles and a tiresome job, Hugo works hard to fix the automaton with pieces from toys which he steals from the train station toy store owned by George Méliès (Ben Kingsley). As the film progresses we see Hugo grow, learn new things and experience memorable moments both good and bad. An important character who plays a large role in Hugo’s adventure is Isabelle (Chloe Moretz) George Méliès’s goddaughter. She accompanies Hugo in his adventure and later on helps him revive the automaton with a key which she stole from her godmother. The automaton is a metal device people built to create illusions but the one Hugo was fixing had the amazing ability to write and draw. Even though this journey was hard for Hugo especially due to the station master (Sacha Baron Cohen) trying to capture Hugo at every turn and send him to the orphanage, he survives and learns about his past and discovers many clues to what his future would be like. One of the best scenes in the movie was the opening. 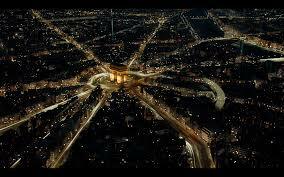 The clockwork slowly faded into the city of Paris with such grace and elegance that it was hard to not be impressed, all that time and effort producers had to put in o create something so magnificent. The bird eye view of the city shows us around the location of the story and what awaits us in the movie. The clockwork fading into the city symbolises world is like a machine and everything within it is a working part helping something in some way. Everything has a purpose to live and this point is strongly proven in the film by Martin Scorsese. Themes we could see from this film would be clockwork, fixing things and the purpose of leaving. The clockwork is used to symbolise that everything has its’ purpose to be alive or created. Like clockwork every part fits together in one way or another to help make things work. “Everything has a purpose, clocks tell you the time, trains takes you to places. I’d imagine the whole world was one big machine. Machines never come with any extra parts, you know. They always come with the exact amount they need. So I figured if the entire world was one big machine… I couldn’t be an extra part. I had to be here for some reason. And that means you have to be here for some reason, too. ” this quote in the movie said by Hugo to Isabelle makes the audience think about the themes and their purpose in life. Overall Hugo is an excellent film with many fascinating concepts such as the purpose of living, the magic created by this theme is something all ages would enjoy. This film is a must watch for all!! I enjoyed this review – you have used my feedback effectively to improve it. You establish a clear personal voice, summarise the plot briefly, and the outline some of the film’s strengths. Your use of language is becoming more sophisticated. Keep up the hard work – it’s paying off!